Christopher J. Van Hollen Jr. (born January 10, 1959) is an American politician serving as the junior United States Senator from Maryland since January 3, 2017. From 2003 to 2017, he held the position of U.S. Representative for Maryland's 8th congressional district. He is a member of the Democratic Party. Van Hollen ran for the United States Senate in 2016 to replace retiring Senator Barbara Mikulski and won the general election 60 to 36 percent. Van Hollen served as Chair of the Democratic Senatorial Campaign Committee (DSCC) from 2017 to 2019. 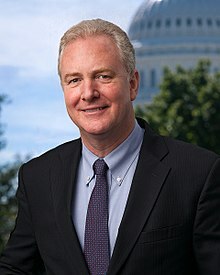 Van Hollen was born in Karachi, Pakistan, the eldest of three children of American parents, Edith Eliza (née Farnsworth) and Christopher Van Hollen. His father was a Foreign Service officer who served as Deputy Assistant Secretary of State for Near Eastern Affairs (1969–1972) and U.S. Ambassador to Sri Lanka and the Maldives (1972–1976); and his mother worked in the Central Intelligence Agency and the State Department, where she served as chief of the intelligence bureau for South Asia. He spent parts of his early life in Pakistan, Turkey, India, and Sri Lanka. He returned to the United States for his junior year of high school, and attended Middlesex School in Concord, Massachusetts, where his grandfather once taught. He is an alumnus of the Kodaikanal International School in southern India. In 1982, Van Hollen graduated from Swarthmore College with a Bachelor of Arts degree in philosophy. He continued his studies at Harvard University, where he earned a Master of Public Policy degree, concentrating in national security studies, from the John F. Kennedy School of Government in 1985. He earned a Juris Doctor from the Georgetown University Law Center in 1990. Van Hollen worked as a legislative assistant for defense and foreign policy to U.S. Senator Charles Mathias, a Republican from Maryland, from 1985 to 1987. He was also a staff member of the U.S. Senate Committee on Foreign Relations (1987–1989), and a legislative advisor for federal affairs to Maryland Governor William Donald Schaefer (1989–1991). He was admitted to the Maryland bar in 1990, and joined the law firm of Arent Fox. Van Hollen served in the Maryland General Assembly from 1991 to 2003, first in the House of Delegates (1991–95) and then in the State Senate (1995–2003). In the Senate, he served on the Budget and Taxation Committee and the Health and Human Services Subcommittee. He led successful efforts to raise the tobacco tax, prohibit oil drilling in the Chesapeake Bay, mandate trigger locks for guns, and increase funding for education and healthcare. In 2002, The Washington Post called Van Hollen "one of the most accomplished members of the General Assembly." Maryland's 8th district hugs the northern border of Washington, D.C., and is one of the wealthiest and most educated congressional districts in the nation. The federal government is the single largest employer in the district, and many private companies are funded by the government. In 2003, he was named Outstanding New Member of the Year by the Committee for Education Funding, the nation's largest and oldest non-partisan education coalition. The first bill Van Hollen introduces every session is the Keep Our Promise to America's Children and Teachers (Keep Our PACT) Act, which would fully fund No Child Left Behind and Individuals with Disabilities Education Act. He introduced an amendment, which passed, that repealed a 9.5 percent loophole in student loans that had allowed lenders to pocket billions of taxpayer dollars. Now, that money is available for additional student loans. Because many federal employees live in his district, Van Hollen has worked on a number of issues relating to them. He supported pay parity in pay raises for civilian employees and introduced an amendment, which passed, to block attempts to outsource federal jobs. Van Hollen has secured federal funding for a number of local-interest projects, including transportation initiatives, local homeland security efforts, education programs and community development projects. He and Adam Schiff (D-CA) often discuss issues of National Security on the floor of the House in tandem, with particular commentary on the wars in Afghanistan and Iraq. In May 2006, Van Hollen formed a congressional caucus on the Netherlands with Dutch-born Republican U.S. Representative Pete Hoekstra from Michigan. The goal of the caucus is to promote the U.S. relationship with the Netherlands and remember the Dutch role in establishing the State of New York and the United States. In July 2006, Van Hollen urged the Bush administration to support a ceasefire supported by a peacekeeping force that would end the 2006 Lebanon War. He was criticized by elements of the Jewish and pro-Israel community, a large part of his constituency, for criticizing U.S. and Israeli policy in the Lebanon conflict. In follow-up comments, Van Hollen indicated that his original comments were meant as a critique of Bush administration policy but did not retract his position, and other members of the local Jewish and pro-Israel community defended him. In 2006, Van Hollen opted out of the race to succeed the retiring Senator Paul Sarbanes, saying he would rather spend time with his family and help elect more Democrats to Congress. In keeping with that, Van Hollen was appointed to Chairman of the Democratic Congressional Campaign Committee. In 2009, Van Hollen introduced a bill which establishes a green bank to catalyze the financing of clean energy and energy efficiency projects. He reintroduced the same bill again in 2014. In March 2010, when Charles Rangel was forced to resign as Chairman of the Committee on Ways and Means over ethics charges, Van Hollen played a key role in having Sander Levin succeed to the Chairmanship over Pete Stark. Stark was the second-most experienced member of the committee while Levin was third, and party tradition would have made Stark chairman due to seniority. However, Van Hollen and other younger members saw Stark's past intemperate comments as a liability to the Democrats in an election year. On April 29, 2010, Van Hollen introduced the campaign finance DISCLOSE Act. He reintroduced the bill for the 113th Congress on February 9, 2012. Shortly after the 2016 elections, Van Hollen was selected as the Chairman of the Democratic Senatorial Campaign Committee (DSCC) for the 2018 cycle. During the campaign, Van Hollen emphasized that even when Morella voted with the district, her partisan affiliation kept Tom DeLay and the rest of her party's more conservative leadership in power. Van Hollen also touted his leadership in the State Senate on issues such as education funding, HMO reform, trigger locks for handguns, and protecting the Chesapeake Bay from oil drilling. Ultimately, after a tight race, Van Hollen defeated Morella 51.7 percent to 48.2 percent. Van Hollen crushed Morella in the Prince George's County portion of the district, while narrowly winning Montgomery County. However, Morella won most of the precincts she'd previously represented. Van Hollen also supports animal rights groups such as The Humane Society, the Society for Animal Protective Legislation (SAPL), Big Cat Rescue (BCR), and Defenders of Wildlife Action Fund, all of whom gave him a 100% approval rating. Van Hollen also received endorsement from the Humane Society Legislative Fund (HSLF) in 2010. Although he supports animal rights groups, Van Hollen received an approval rating of 0% from the Sportsmen's and Animal Owners' Voting Alliance (SAOVA). In his 2016 Senate platform, Van Hollen supported an increase in the minimum wage, paid sick leave, an expansion of the Earned Income Tax Credit, equal pay for women, an increase in the child care tax credit, and a financial transactions tax. Van Hollen has been endorsed by the Brady Campaign to Prevent Gun Violence, a group which campaigns for more government regulation of guns. Van Hollen received a 0% from the Gun Owners of America (GOA) in 2006. In September 2008, Van Hollen voted against repealing portions of the Washington, D.C. Firearm Ban. In 2015, Van Hollen introduced legislation for increased handgun licensing, specifically the requirement for permit-to-purchase licenses. This proposal was based on a similar law that exists in Maryland. On proposing the law, Van Hollen stated that "States require licenses to drive a car or even to fish in local rivers, so requiring a license to buy a deadly handgun is a common-sense step that could save countless lives." In response to the 2017 Las Vegas shooting, Van Hollen co-sponsored a bill to ban bump stocks. Van Hollen supports Obamacare and has defended it many times. He is also pro-choice. In October 2018, Van Hollen and Susan Collins cosponsored a bipartisan bill that if passed would block "any persons from foreign adversaries from owning or having control over vendors administering U.S. elections." Protect Our Elections Act would make companies involved in administering elections reveal foreign owners, and inform local, state and federal authorities if said ownership changes. Companies failing to comply would face fines of $100,000. Van Hollen received a 0% rating for the Citizens Against Government Waste (CAGW), and the National Taxpayers Union (NTU), in 2010. Both these organizations advocate for lower taxes for everyone including the wealthy. In 2006, Van Hollen received a 100% rating from Citizens for Tax Justice (CTJ), a group that calls for higher taxes on the wealthy. Van Hollen opposes eliminating the federal estate tax. Van Hollen and his wife Katherine have three children: Anna, Nicholas, and Alexander. Van Hollen is of Dutch descent.